It’s well and truly autumn, and unfortunately that brings with it a whole host of rubbish things; shorter days, darker nights, and of course your fair share of drizzly British weather. This can play havoc with your hair, especially if you’re prone to frizz, or just want to keep your style looking nice for longer than a few minutes after leaving the house. That’s why we have collected the best expert tips to help you deal with unexpected downpours – so matter what the weather throws at you, you’ve got this. And that cool shot on your hairdryer (yes, the one you probably rarely use) is super useful for keeping frizz at bay too. “If you are blow-drying your hair, be sure to seal your final look with a cold blast of air from your hairdryer – turn the setting to cold then press the cool shot button. 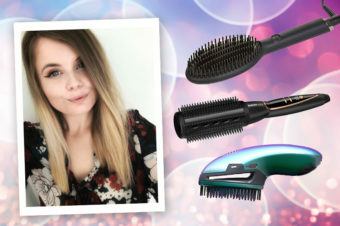 Follow the movement of the brush, focusing on the root area with the cold air for about 5-10 seconds per section to seal the cuticle for amazing shine, longevity and hold,” explains Zoe Irwin, ghd UK ambassador. Our final tip is from Adam Reed, who’s half of the Percy & Reed duo, responsible for some of the coolest catwalk looks and ghd’s global ambassador. “Spray hairspray directly into your hands and press down onto the hair using your fingertips,” he suggests. “I don’t usually spray directly onto the hair – using your hands means you can apply with precision. Press the hairspray from your hands into the key areas of the hair that can be affected by damp and frizz e.g. your parting and baby hairs at the front! Then, use the warmth of the back of your straightener (turn it off after styling so it is still warm!) to seal down any additional loose hairs. This fills the hair strand and prevents rain getting in by warming the resin of the product for long lasting protection.” So next time you lose your um-ber-ella (ella, ella, ella), don’t panic – just bookmark this page and enjoy lovely frizz free hair whatever the weather! 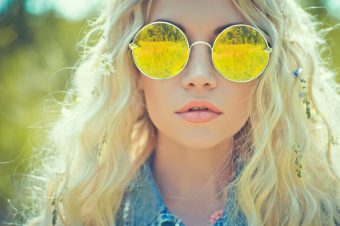 Four days of festival hair – so you can concentrate on partying!